After yesterdays post on “What Is A Wheat Belly?”, I received a few comments from readers wondering how they can be tested for the presence of visceral fat and how can they reduce the amount of it? I just found this well written, clear and concise article from the Health Bulletin site. They list a few options for testing visceral fat such as CT scans, bioelectrical impedance and circumference measurements. CT scans are expensive and put the patient at risk for unnecessary radiation especially when the circumference measurement test can be done at home, with a simple measuring tape. When I was a fitness appraiser I did at least half a dozen waist-to-hip ratio tests per day. 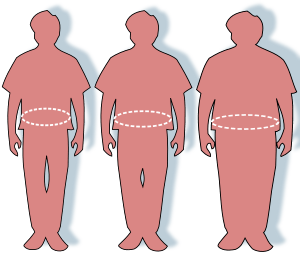 Basically, if the ratio from the girth circumference measurement from your abdomen is larger than the girth circumference measurement from your hips (taken at the largest buttock protuberance) then consider yourself in the visceral fat category. You can also take an honest look at yourself in the mirror to know where you’re at. A word of caution: It is also possible for people to be “skinny-fat”. I’ve seen many who’s body fat is so evenly spread over their body that they don’t have the typical body shape of someone who is overweight; they tend to ‘carry it well’ (at least in clothes). I often see this in men who wear business suits. The suit hides it and just makes them appear ‘solid’. This is worrisome because they ‘get away’ with not exercising and eating recklessly because they don’t show an outward appearance of carrying excess fat (until the suit comes off!). Check out the Health Bulletin site it has a lot of very useful information. A word on BMI: BMI stands for Body Mass Index. Often doctors use this measurement to determine if a persons weight is acceptable for their height. It has it’s draw backs and in our household this test is a laughing stock. My husband, who at 5’9″ weighs in at 168 lbs. of solid muscle and at approximately 7% body fat – according to the chart he is overweight. So as with everything, one must do their homework and think through the process, beyond the numbers. ← What Is a “Wheat Belly”?